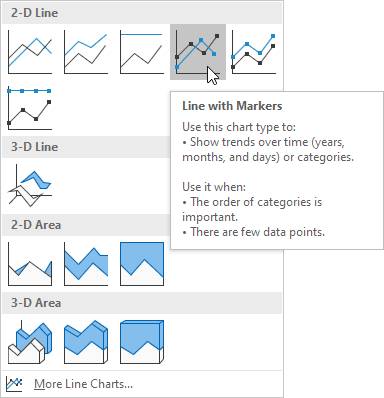 To create a line chart, execute the following steps. 1. Select the range A1:D7. 2. On the Insert tab, in the Charts group, click the Line symbol. 3. Click Line with Markers. Note: enter a title by clicking on Chart Title. 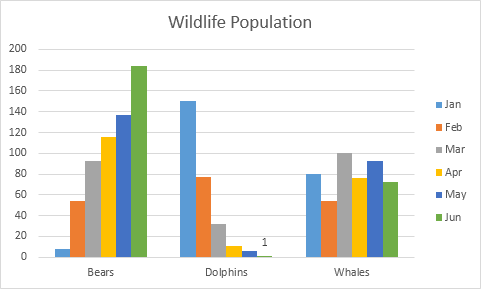 For example, Wildlife Population. 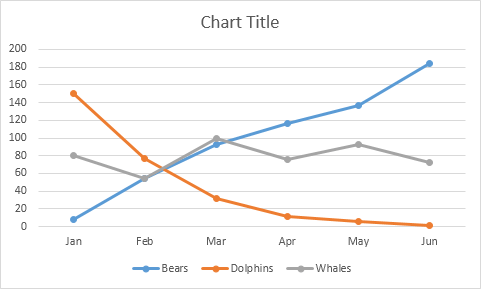 You can easily change to a different type of chart at any time. 3. On the left side, click Column. 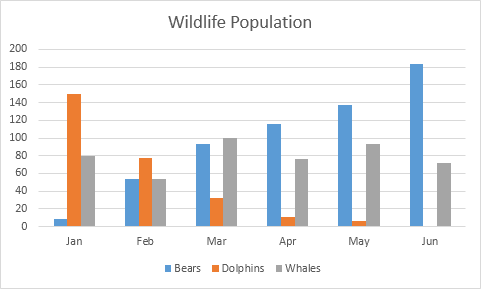 If you want to display the animals (instead of the months) on the horizontal axis, execute the following steps. 2. 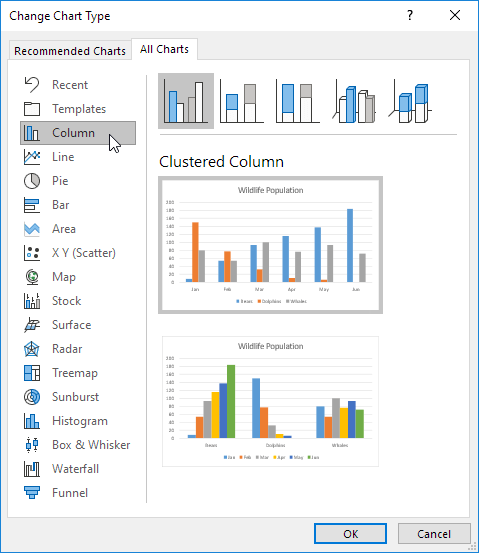 On the Design tab, in the Data group, click Switch Row/Column. 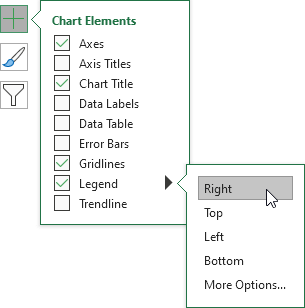 To move the legend to the right side of the chart, execute the following steps. 2. Click the + button on the right side of the chart, click the arrow next to Legend and click Right. 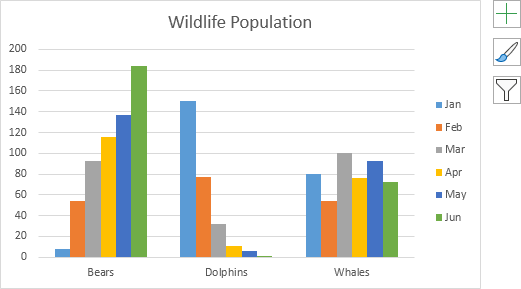 You can use data labels to focus your readers' attention on a single data series or data point. 2. 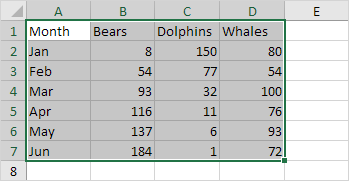 Click a green bar to select the Jun data series. 3. 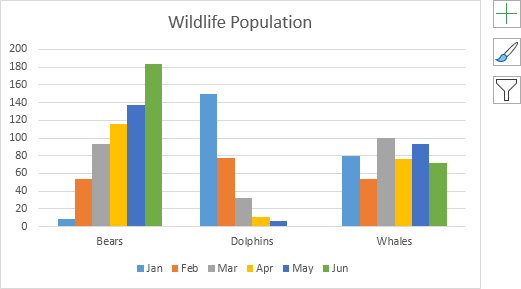 Use your arrow keys to select the population of Dolphins in June (tiny green bar). 4. 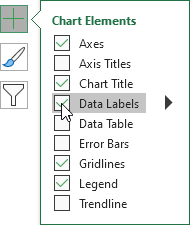 Click the + button on the right side of the chart and click the check box next to Data Labels.